In Mexico City, The Return Of Terrible Smog : Parallels Mexico City has its worst smog in more than a decade. The government has ordered cars off the street one day a week, but city planners say that isn't a long-term solution. 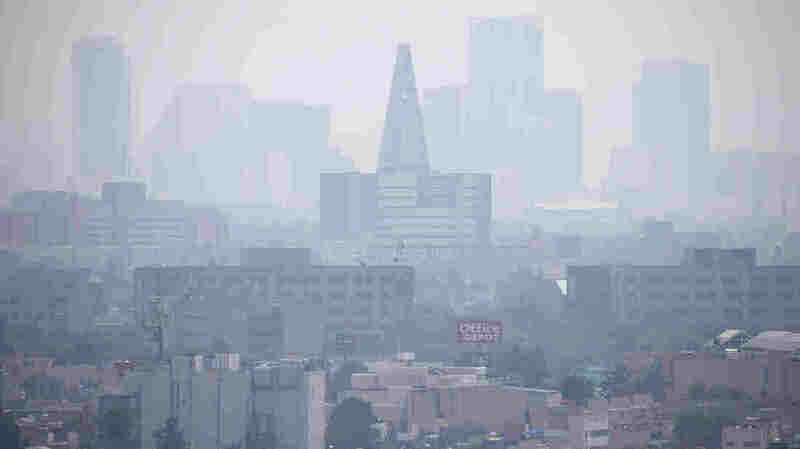 Smog blankets scyscrapers in Mexico City on March 17. The city is suffering its worst pollution in more than a decade, and cars are required to stay off the street one day a week. Springtime is usually beautiful in Mexico City. As the weather warms, the purple jacaranda trees that line boulevards and dot neighborhoods are in full bloom. Everything is prettier, says Fernando Padilla, a driver taking a break in a park. "It's my favorite time of the year," he says. But this spring, his eyes are watering, his throat hurts and one day a week he's not allowed to use his car on the road, which means he's poorer too. Julieta Mejia Cabrera, 10, isn't happy either. Today she got to go to the park, but since the anti-smog plan has gone into effect, she says everyone at her school has to eat lunch inside their classrooms. "We can't play with our friends," she says. "It's so boring. It's like being at home." Last month, for the first time since 2005, Mexico City officials declared a Phase 1 smog alert. Based on license plate numbers, every car must be kept off the road one day a week and one Saturday a month through the end of June. That's the start of the rainy season, which usually clears the air. Smog levels aren't as high as in Beijing, or even as high as they were here back in the 1980s and 1990s. But last week the pollution was so bad — more than twice acceptable levels — the city ordered even more vehicles off the streets. As one columnist said, it was heaven for drivers on the traffic-free streets, but hell for those forced down into Mexico City's already saturated subway. Sarah Chavaria was trying to get to her job in a butcher shop near downtown but had already watched four packed trains go by. "The subway was full before the smog alerts. Now it's worse than ever," she says. "I've been crushed, stepped on, and everything in between." By the time she gets to work, she adds, she is already stressed out. 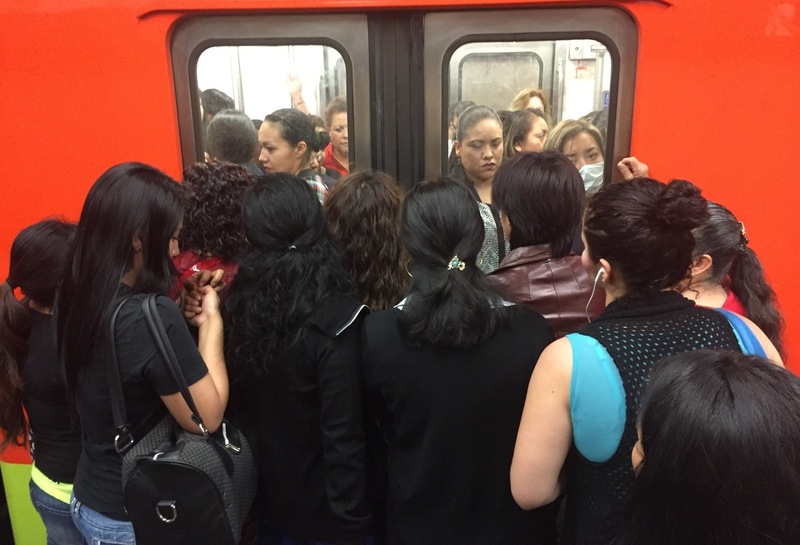 Mexico City's already congested subway has become even more crowded since the government has limited the number of cars on the street to combat smog. Mexico City's public transportation hasn't kept up with its population growth, especially in the suburbs. Government housing policies and investment in highways over public transportation have led to ever increasing sprawl. There are now 23 million people in the Mexico City metropolitan area and nearly 6 million registered cars, says Gabriela Alarcon, an urban development specialist with the Mexican Institute for Competitiveness. She says more needs to be done than just restricting traffic by license plate numbers. "Because people adjust, and they buy an additional car and [add] even more congestion to an already congested city," Alarcon says. And, Alarcon says, Mexico's smog standards are behind the times. Cars bought in Mexico in 2016 have the same tailpipe emissions as a 2004 car sold in the U.S.
At a pizzeria, manager Juan Carlos Gutierrez says the delivery motorcycle was barred from the road the day before, so deliveries are down. "I'm crying twice as much," says Gutierrez. "Once for all the smog in my eyes and again because of all the money I'm losing."